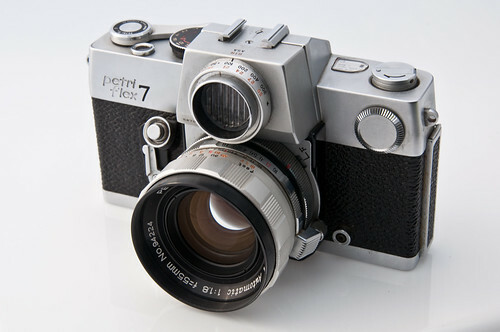 Petri Flex 7 with 55mm f/1.8 lens. 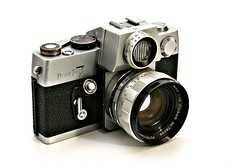 The Petri Flex 7 is a 35mm SLR camera made by Petri in 1964. The camera has an externally-mounted round CdS meter sensor on the front of the prism, giving it a very distinctive appearance. It has a focal-plane shutter with cloth blinds, giving speeds from 1 to 1/1000 second, plus 'B'. It has a PC socket and cold shoe, and a self-timer. 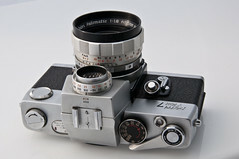 It has a breech-lock lens mount; the standard lens is an f/1.8. 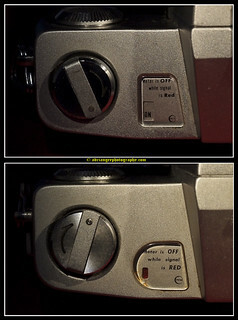 The camera stops down the aperture automatically at exposure. There is an Auto/Manual adjustment ring on the lens; this is used for depth-of-field preview, and does not give auto-exposure. The film speed is set with the rim of the meter cell; speeds from 10 to 800 ASA may be set. The meter indicates Exposure Values from 4 to 18 at 100 ASA, and the reading is used for match-needle adjusment in the viewfinder. Also in the viewfinder, there is a micro-prism focusing aid. The light meter requires a single mercury cell, or substitute. This page was last edited on 2 August 2014, at 01:30.